“Le plus célèbre des cinéastes inconnus”: this is how Philippe Dubois (5) describes the mysterious figure of Chris Marker, the French filmmaker recently deceased and celebrated in 2014 with a solo exhibition held at the London Whitechapel Gallery. Marker died on 29 July 2012, at the considerable age of 91, and yet his loss has left a feeling of emptiness in the world of cinema and among his admirers. Perhaps this is because during his life the director was always surrounded by an aura of mystery. Marker always looked for anonymity, resisting the exposition of his personal image. His biographical data, along with his real name (Christian François Bouche-Villeneuve) and the date and place of his birth, are confusing and sometimes contradictory. It is thus possible to talk of a “mystère Marker”, with reference both to the filmmaker’s tendency towards invisibility and to a sort of corresponding silence about him from the critics (Perniola 10). Marker refused to be photographed, avoided interviews and personal contact, and even obstructed the accessibility of some of his works. Notoriously, when someone asked for a picture of him, he usually sent a photo of a cat, his favourite animal. His personality therefore appears as a puzzle to be reassembled, as fragmentary and heterogeneous as his work. A photographer, novelist, literary critic, essayist, and filmmaker, Marker has always been a prolific artist, never afraid of crossing borders, moving from traditional media to new technologies, from cinema to installation art, from CD-ROM to virtual projects. His broad legacy has been documented and reassembled within the rooms of the Whitechapel Gallery, in the exhibition co-curated by Christine van Assche, Chief Curator of the Centre Pompidou, Paris, and by writer and film critic Chris Darke (in collaboration with Whitechapel Gallery chief Curator Magnus Af Petersens and assistant Curator Habda Rashid). The show was accompanied by a catalogue titled A Grin Without a Cat, containing essays by Raymond Bellour, Arnaud Lambert and Nicola Mazzanti, along with some of Chris Marker’s own writings. In addition to photos, letters and rarely exhibited films such as Statues Also Die (Les Statues meurent aussi, codirected with Alain Resnais and Ghislain Cloquet, 1953), Le Joli mai (codirected with Pierre Lhomme, 1963), and The Case of the Grinning Cat (Chats perchés, 2004), his first U.K. retrospective has also brought back to life Marker’s multimedia installations, all of which had been previously exhibited at museums worldwide but which were shown here together for the first time. Best known for films such as La Jetée (1962) and Sans Soleil (1983), Marker made his debut collaborating with Alain Resnais on films including the aforementioned Statues Also Die and Night and Fog (Nuit et brouillard, 1955). The exhibition followed the central themes of the oeuvre of Chris Marker who, with his fine exploration of issues of memory and narration, is widely acknowledged as the main proponent of essayistic filmmaking. “Museum”, “Travel”, “Image & Text”, and “War & Revolution” were the chosen central themes that collated the work of the director and guided visitors through the exhibition. Big screens were spread around the gallery space: there was a large projection of Ouvroir: The Movie (2010) at the entrance of the gallery, an extract from Sans Soleil in the adjacent room, and a screening of La Jetée with an alternative opening sequence on the second floor. Over the course of his career, Marker continuously engaged with new technologies and often ventured into the territory of audiovisual experimentation and interactive video installation. Level Five, his 1997 film, at once closed his production linked to the cinema and opened a new phase of his work. The film in fact inaugurated Marker’s exploration of the relationship between electronic image, video and film, and paid decisive attention to digital technology, which would be at the centre of his subsequent installation art and multimedia projects. As already mentioned, the Whitechapel show was also a rare opportunity to experience all of Marker’s renowned installations. Zapping Zone. 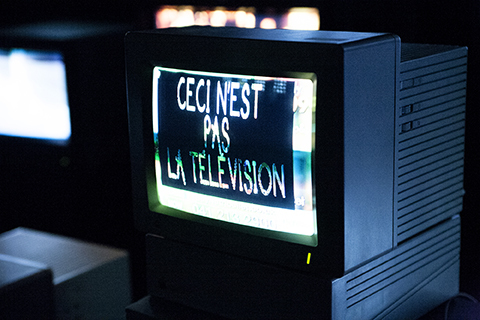 Fragments d’une télévision imaginaire (1985) is a multimedia installation originally conceived for the Centre Georges Pompidou and recreated for the London show. One of the first rooms of the London exhibition was filled with a series of about twenty different monitors, all showing different images taken from film and television programmes. The title of the installation on the one hand makes reference to the “zone” introduced by Andrei Tarkovsky in Stalker (1979), and then reelaborated by Marker in Sans Soleil to describe the space in which Hayao Yamaneko’s images are transformed; on the other hand, it recalls the common practice of zapping between television channels, an incessant movement between images of all sorts. Figure 2: Zapping Zone (Proposals for an Imaginary Television), 1990–1994. 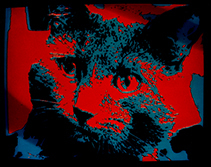 Video still from multi-media installation. Production du Service Nouveaux Médias, CGP © Coll. Centre Pompidou. Photo: Georges Meguerditchian. Figure 3: Zapping Zone. Multi-media installation (detail). 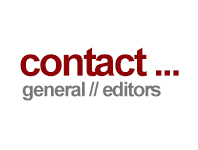 Production du Service Nouveaux Médias, CGP. Photo: Rosey Trickett. The memory of the traveller comprises all the fragments taken from a collective memory. Marker’s conception of travel as historical memory is very visible in his films, as is his fascination with different cultures. On the second floor of the gallery travel was connected with war and revolution, displaying black and white photographs by the director, and film extracts in a section titled “When the Century Took Shape: War and Revolution”. The rare display of the entire collection of Petite Planéte (1954–1958), a series of 31 travel books realised by Marker when he was working as an editor for the Éditions de Seuil, was remarkable. The posters of the covers, each dedicated to the image of a woman, were displayed on a wall, recomposing a mosaic of faces from Iran, Japan, Yugoslavia, China and many other countries. Every volume in fact begins with the photograph of a woman, and contains images from Marker’s and his friends and colleagues’ travels and personal archives. 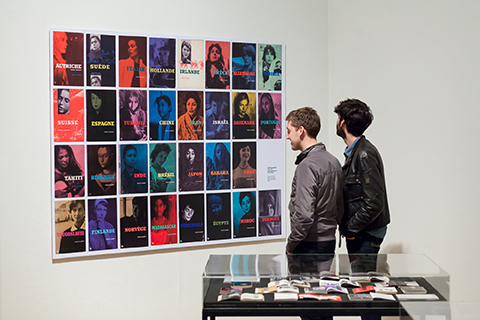 Figure 4: Installation view at the Whitechapel Gallery. Chris Marker: A Grin Without a Cat (16 April – 22 June 2014). Photo: Patrick Lears. If memory is one of the main themes of Marker’s work, Ouvroir: The Movie, the project that welcomed the visitors at the gallery entrance, is an example of the powerful inclination demonstrated by the filmmaker to take unknown roads in the course of his professional life. 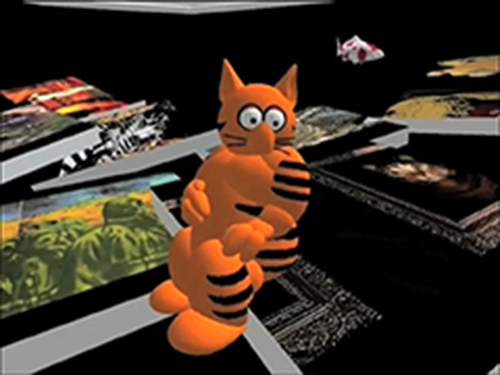 In the digital, online land of Second Life, the French director created a museum, and a virtual tour of his work, led by the animated orange cat, an alter ego of Marker himself, called Guillaume-en-Égypte. Here, as in other works, an ironic and paradoxical assemblage of elements combines works of art by Goya, Ingres or Jacques-Louis David with animated cartoons like Snoopy, Mickey Mouse and even the Cheshire Cat from Alice in Wonderland. Personal and collective dimensions are intertwined, following the juxtaposition of memorial objects taken from a cultural memory. Metamorphosis and anonymity go in the same direction, towards the annulment of identity and the emergence of collective assemblages of recollections: “The true traveller is shrouded in mystery and anonymity, ... Marker as Ulysses is called Nobody” (Perniola 16; my trans.). Following the typical essayistic procedure, the role of the spectator here is to complete the work, building new narrative trajectories and discovering original creative possibilities. In our own journey within the gallery space, we discovered the different perspectives of the gaze of a visionary journalist, essayist, editor, photographer, writer, filmmaker, and new media artist. “Who is Chris Marker? Better to ask ‘How many Chris Markers have there been?’”, Chris Darke wonders, introducing Chris Marker: The Invisible Man (32). A myth emerged around his figure and his oeuvre. Invisible, unclassifiable, multiple and labyrinthine: all of these adjectives are suitable to describe his work, and even his nature. Such hybridity is the real trait of the director’s indefinable artistic personality, and the only trace of his invisible profile. In the latter stages of his life and work, Marker was able to intertwine his personal memory with a broader collective and universal archive. He almost succeeded in merging his personal image with the one of his online cat-avatar, whose picture stood in the space of the gallery as if it were the image of the filmmaker himself. An unwilling citizen of the era of maximum public exposure and visibility, Chris Marker found his own way of disappearing. Darke, Chris. “Chris Marker: The Invisible Man.” Film Comment 39.3 (2003). Web. 9 Dec. 2014. <http://www.filmcomment.com/article/chris-marker-the-invisible-man>. Darke, Chris, and Habda Rashid, eds. A Grin Without a Cat. London: Whitechapel Gallery, 2014. Exhibition catalogue. Dubois, Philippe. Théorème 6: Recherches sur Chris Marker. Paris: Presses Sorbonne Nouvelle, 2002. Print. Le Joli mai. Dirs. Chris Marker and Pierre Lhomme. Sofracima, 1962. Film. Lupton, Catherine. Chris Marker: Memories of the Future. London: Reaktion, 2005. Print. Marker, Chris, dir. The Case of the Grinning Cat [Chats perchés]. Films du Jeudi, 2004. Video. ---. Immemory One. 1997. Interactive Multimedia installation. ---, dir. La Jetée [La jetée]. Argos Films, 1962. Film. ---, dir. Level Five. Les Films de l’Astrophore, 1997. Film. ---, dir. Sans Soleil. Argos Films, 1983. Film. ---. Silent Movie. 1995. Video Installation. ---. Zapping Zone. Fragments d'une télévision imaginaire. 1985. Mixed Media Installation. Night and Fog [Nuit et brouillard]. Dir. Alain Resnais. Argos Films, 1955. Film. Perniola, Ivelise. Chris Marker o del film-saggio. Turin: Lindau, 2011. Print. Stalker [Сталкер]. Dir. Andrei Tarkovsky. Kinostudiya “Mosfilm”,1979. Film. Statues Also Die [Les Statues meurent aussi]. Dir. Ghislain Cloquet, Chris Marker, and Alain Resnais. Présence Africaine, 1950–53. Film. Vertigo. Dir. Alfred Hitchcock. Alfred J. Hitchcock Productions,1958. Film. Busetta, Laura. “Chris Marker: A Grin Without a Cat.” Exhibition review. Alphaville: Journal of Film and Screen Media 8 (Winter 2014). Web. 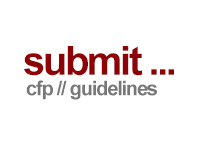 ISSN: 2009-4078. Laura Busetta holds a PhD in Film Studies from Sapienza University of Rome (2013). Having published on subjective cinema, she is now pursuing research on self-representation in digital film and media. Her monograph titled The Self-portrait Film is forthcoming with Sapienza University Press (2015).